Cheeky high school senior, Sophie Green, wants to lose her virginity. What she doesn’t want is to discover that monsters are actually real. But the boy she chooses has exactly those kinds of secrets and she finds herself in the center of a monstrous scheme. Now it’s up to her to make sense of the mess in her heart. . .or kiss her humanity goodbye. What choice will Sophie make? To see if she will tidy up the mess in her heart, I’ve been joined by Einat Segal, author of the paranormal fantasy novel, My Monster. Einat, let’s set the stage for our readers by dipping into the story of how this tale began. What can you share with us? I wanted to write a book that rebels against teen paranormal romance and also shows teen sexual positivity from the female standpoint (done safely and from a mature standpoint.) There aren’t hardly enough books where the heroine calls the shots about her fate and her desires. I like the idea of a heroine calling the shots. Do you remember how your heroine, and her supporting cast of course, came to life? I was probably thinking about “Ten Things I Hate About You’ when I came up with Sophie. The other characters were simply there already when I started writing. Were the events that Sophie and her friends experience in this book also inspired by Ten Things I Hate About You, or do you feel like they came from your own teen years? I wish I was a little bit more like Sophie when I was a teen and much less like the shy, geeky mess that I was. I think I did draw from my own sexual positivity, though. Was the importance of your own sexual positivity translated to fiction the most important thing you wanted readers to take from reading your book? What I wanted most was for it to be a fun read and to give voice to the rebel inside us all. Sophie’s kind of like cool female version of Holden Caulfield. Writing a female version of Holden must be tonnes of fun! Did you just keep thinking of how much fun you were having as you wrote? I actually thought of my dog. She often stares at me while writing. I don’t know why. Maybe she can feel your excitement and love of writing and feels that she might be able to absorb a little while you write. Or she just might want another walk! Do you feel that writing is an energising process for you even while you have your dog’s keen eye on you? Or does the intense canine observation and commitment to your work get a little tiring at times? It depends. It sometimes feels like an unhealthy obsession but when I take a long break I discover that it’s what gives colour to my life. Writing is a type of blessed curse. Do you think that you’ve seen an improvement in your writing as you’ve continued to battle with the blessings and trials of the writing course? It got worse. A lot worse. Almost everything I write these days comes out riddled with dry humour. That’s not too bad for fiction, but I can see how that could you get you into some real trouble with any kind of formal or business writing. But we’re not doing business today, we’re having fun, so let’s give that sly, dry humor a litle workout with some quirkier questions like, if you could breed two animals together what new animal would you create? Dog+turtle. I’d like to have a dog that lives longer, even at the cost of making them less cuddly. I’d like to see some ancient dog wisdom, and I think that trading off the fur might just be worth it. What’s your favourite word? Silhouette. I never spell it correctly. The best way that I’ve found to conquer any spelling challenges is to make that word essential to your day. So, maybe your next novel needs to be all about silhouettes. You never know, they could turn into pretty cool monsters too! If you invented a new type of monster what would it look like and what would you call it? It would be called “An Accountant”. *Laughs* Oooh, a corporate thriller. I’m game! Keeping ourselves all a tingle with thrills, what do you think happens if Batman gets bitten by a vampire? Hhmmm, that’s less thrilling than I would have liked. So let’s got back to flights of fancy fun with the conundrum, can you cry underwater? I’m not that great at crying above water. Me either, but somehow the idea of crying underwater feels like it might be a little more private. If space is a vacuum, who changes the bags? Vacuums with bags are out of vogue these days. Now they’re all bagless and cordless. I kind of miss the bagged days, I feel there was a stronger sense of accomplishment when you managed to fill an entire vacuum bag. Do you feel a similar sense of accomplishment, and perhaps a sense of accomplishment by continuing to build your author brand, when you finish a book? I’m one of those “no clue what I’m doing” type of authors. I try to maintain that as well as I could. I’m sure you have more of a clue than you let on. And I’m sure with each new book you learn something new. What did you learn from My Monster? You can’t please everyone. If you write a book that knocks down walls, not everyone will appreciate it. You can never please everyone, so why not write what you please. And what pleasing writing are you working on now that My Monster is published? I’m currently editing the sequel to “My Monster” while working on a high concept YA fantasy project aimed towards the more traditional market. Both of those projects sound like so much fun, I think it’s a shame to take any more time away from them. Einat, thanks so much for sharing a taste of My Monster with us today, and I can’t wait to see the sequel soon! Excited to read the book we discussed today? Find it here on Amazon: ‘My Monster ( ASIN: B07G31FD5B )‘. 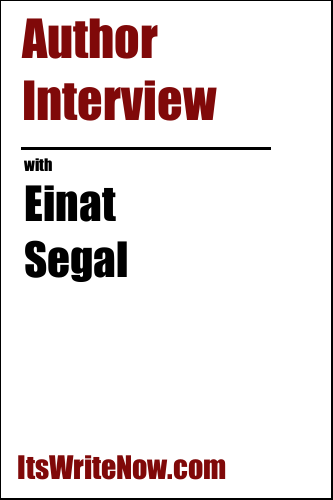 Want to find out more about Einat Segal? Connect here!